1. 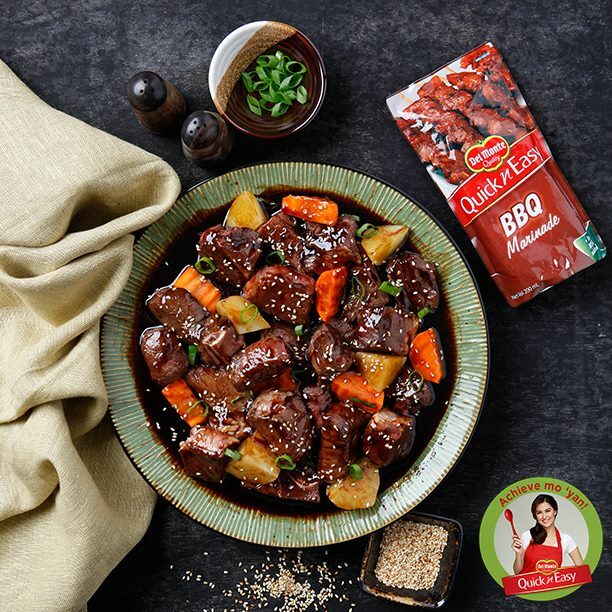 Marinate meat in Del Monte Quick BBQ and garlic marinade overnight in the refrigerator. Drain and reserve marinade. 2. Sprinkle with 2 flour and brown in 2 tbsp oil. Set aside. 3. In the same pan, add onion, reserve marinade and ¾ cup of water. Cover and simmer over low heat for 1 hour or until meat is tender. 4. Add mirin. Heat for 2 minutes. Stir in potatoes and carrots. Top with sesame seeds.